We’ve already given you our top 18 picks for this year’s Winterlicious. There are over 200 restaurants in and around the city participating in the culinary event that takes place January 26 to February 8, 2016. Prix Fixe menus are available at most participating restaurants for lunch and dinner. But now we’re digging a little deeper if you need a little more help in deciding, just don’t wait too long to reserve! If you’ve never booked a Winterlicious meal, this is really the year to do so. Although we’ve noticed that the meal prices have gone up from the past years, the menus overall are more creative and still a good value. Remember you’re getting an appetizer, entree and dessert for the prices offered. We were invited into Café Boulud at the Four Seasons Hotel Toronto for a preview of what to expect this coming Winterlicious. 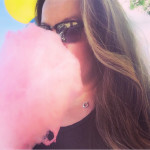 The items on their menu features some of their most popular dishes. This restaurant that is inspired by Michelin Star Chef Daniel Boulud’s French upbringing. 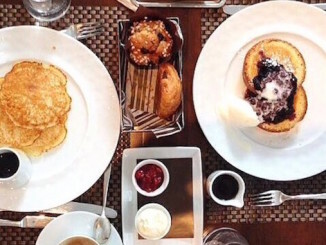 For those who are not familiar, Chef Boulud has 7 restaurants in New York City and 6 others in the US and internationally including London, Montreal and Singapore. 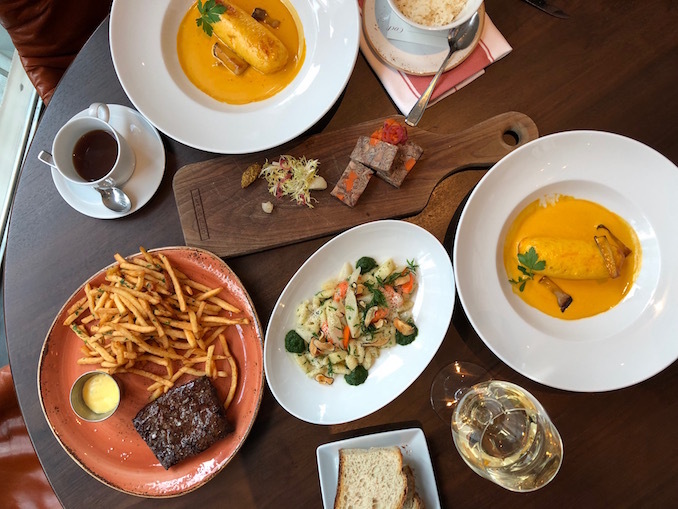 This French Brasserie is located on the second floor of the hotel. French chef, Sylvain Assie, is the Chef de Cuisine at the hotel’s signature restaurant that showcases Boulud’s vision. He too grew up in France in a small village with his family near Montpellier and his career with Four Seasons began in the South of France. So, okay, you want to know what to expect? Prix fixe menu for lunch is $33 and $53 for dinner. We were pretty happy with the decent portion sizes too. Too often in the past years, some restaurants just offered small portions during Winterlicious, but we haven’t found that reflected here. The menu won’t leave you feeling hungry when you’re done! 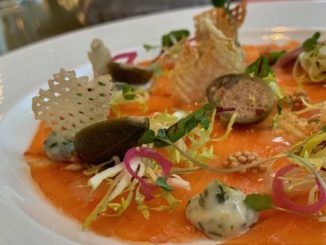 We’ve always thought the Charcuterie offerings at Café Boulud as the best in the city. 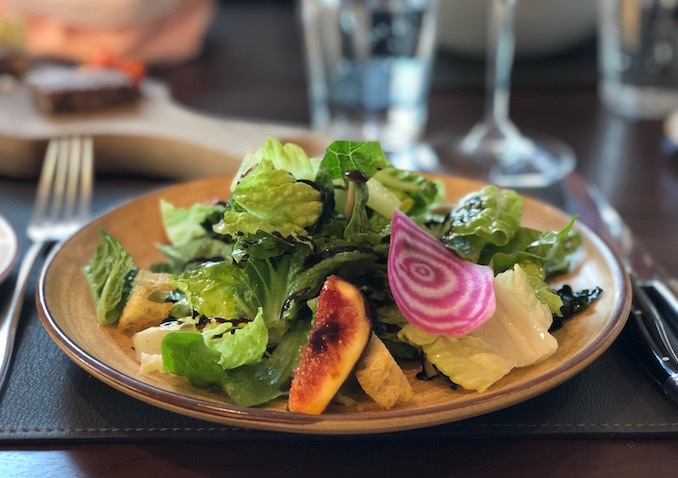 We were happy to set our eyes on the Coq au Vin Terrine as an appetizer and the Grilled Kale Salad is one of our all time favourite salads in the city. That’s on there too. The Smoked Salmon on a bed of field greens is also a substantial starter and not too heavy as you prepare yourself for the mains. You can always rely on ordering the Steak Frites as your lunch main — a grilled flat iron steak that is cooked to perfection and accompanied by restaurant’s most addictive fries. Always a French bistro favourite and you really can’t go wrong here. 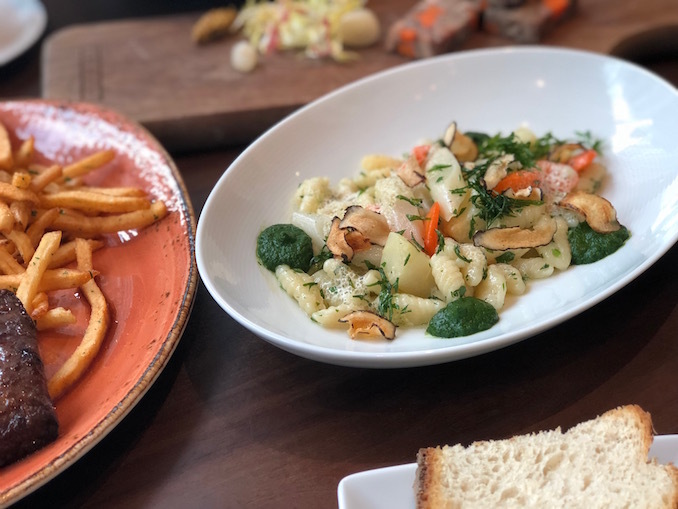 For vegetarians, we had a chance to taste the delicious Cavatelli pasta made with root vegetables, parsley puree and comte cheese foam that is offered on both lunch and dinner menus. The Pike Quenelle is the dish that intrigued us the most. Cooked Lyon-style it stems from the traditional French method of cooking that originated in the 16th century by the women of the Lyon, France, who once cooked for prominent families. They went on to open their own local restaurants serving dishes that featured local produce. The Quenelle is very popular and is often described as a large dumpling. This usually is made with wheat or semolina flour, butter, eggs, milk and fish. Pretty much tradition to be served with Nantua sauce and rice. Chef Boulud was actually raised on a farm outside of Lyon. We were delighted to see our favourite desserts on the Winterlicious menu as well. 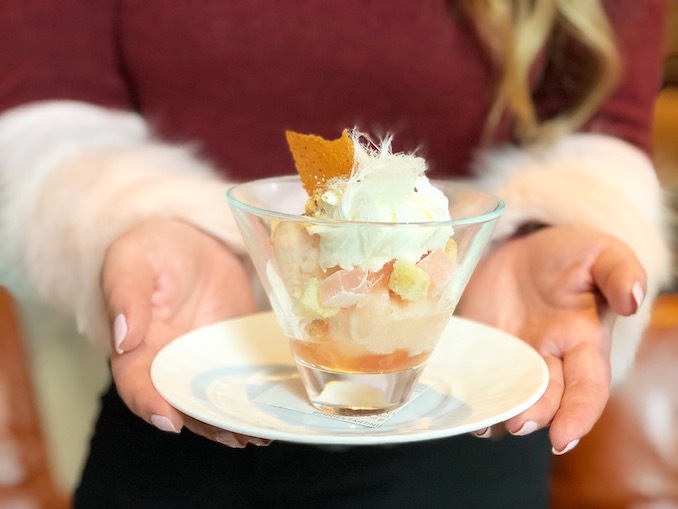 Both the Profiteroles (with vanilla ice cream, dark chocolate sauce, candied pecans) and the Grapefruit Sundae (with sesame halva, rose loukoum, grapefruit sorbet) are slight variations from the restaurant’s normal menu. The Ile Flottante (steamed meringue, maple sugar, creme anglaise) is beautiful and our first try and of this delicately sweet cloud. Valentine’s Day Restaurants to get your Harry and Sally On!